The name cheetah is used to refer to both females and males. It is a carnivorous creature and regularly sustains on fresh meat. Its most loved food is impala and gazelle. It is different from other cats and it generally hunts in the early mornings and late afternoon. It depends generally on location other than other senses when hunting. You will see it at termite hill or on a tree top scanning over the land looking for new prey. It is noted as the quickest creature on earth. Everybody recognizes what a cheetah is. We find out about them when we're youthful, around the same time we realize what giraffe's lions, elephants and different animals are, and we all grow up with a sort of commonality towards them. Aside from zoos where animal kept for people to see, numerous individuals will never see one of the animals really, all things considered, thus despite the fact that we comprehend what they are we keep up a sort of separation from them in our everyday presence. Due to this there are various interesting things about these specific types of cat that quite a few people are basically uninformed of. 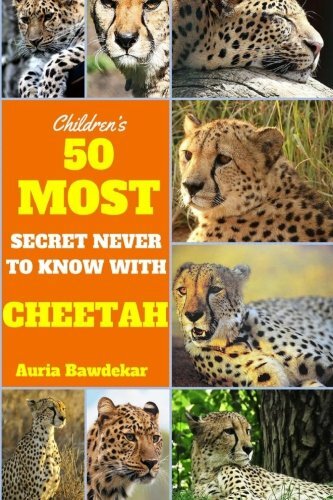 Auria Bawdekar is an elementary school teacher who loves writing educational books for kids. She hopes you find him books interesting and helpful. Curious what Ruth means? Click here to find out!